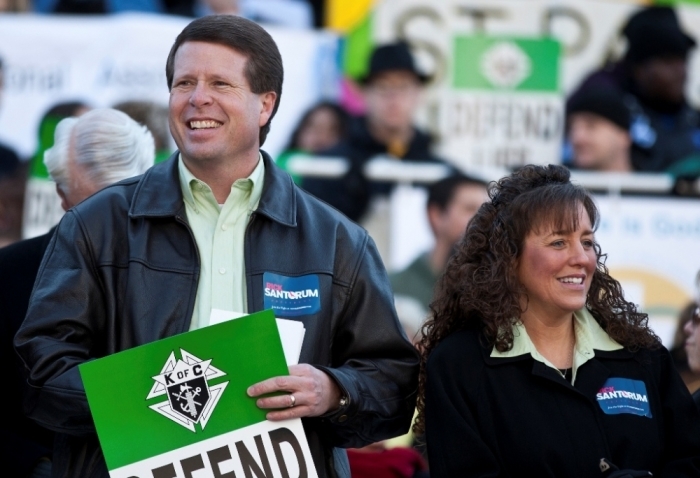 "19 Kids & Counting" matriarch Michelle Duggar has opened up about her struggles with self-worth and bulimia before knowing God in the latest season of the reality series. "Before I came to know the Lord, I had been struggling in my self-worth, just feeling like I needed to measure up to all my friends. I began to have a wrong view of who I was, I gained weight so easily. I ended up starting a bad habit of making myself get sick after I ate. As I was in that process, no one knew," Michelle said in the upcoming episode. She actually went public with her ordeal in the book Growing Up Duggar, which was written by her daughters Jana, Jill, Jessa, and Jinger. She went by a pseudonym in the book but then later did acknowledge that the story was about her. "I have been open with my struggles with the kids before," Michelle told People last year. "We talk about how God has brought us out of different things along life's way. When the girls were writing their book, they brought this up and I thought, if my sharing it is going to help another young lady, then I want to share it." However, since her childhood, Michelle has managed to maintain a healthy weight and also set an example for her own daughters. The mother of 19 decided to offer a sense of transparency to the young women and has decidedly chosen to live her life free of judgment. She and husband Jim Bob have welcomed all the children God chose to bless them with and live their lives according to God's will. And now, daughter Jill will soon be welcoming her first child, a son with Derick Dillard, due anytime this month. Son Josh is also expecting, although it is his fourth with wife Anna. Daughter Jessa and her husband Ben Seewald have said that they hope to adopt either ahead of, or in addition to, having biological children.